John Bryce (1833–1913) was born in Scotland, and arrived in New Zealand with his family in 1840. From humble origins, and self-taught, he entered local politics in 1859. In 1866 he was elected to represent Wanganui in the General Assembly. Bryce fought against Titokowaru in 1868, and was later accused of being involved in an incident at Handley's woolshed, where several young Maori boys out hunting pigs were killed or wounded. 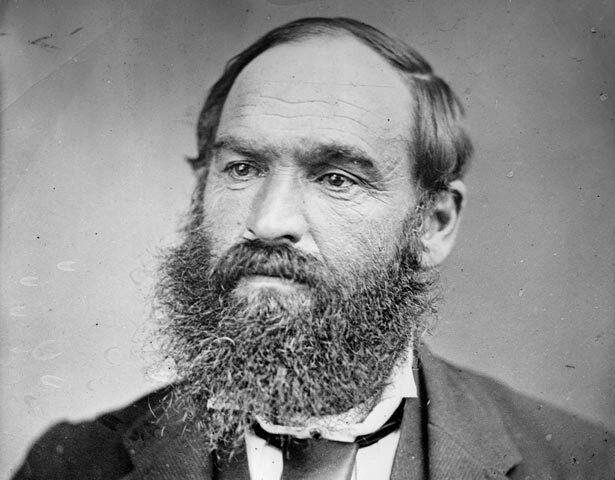 In 1883 Bryce won a case against G. W. Rusden, who claimed in a history of New Zealand that Bryce had cut down women and children 'gleefully and with ease'. Bryce sued Rusden for libel, and the case was heard in the High Court in London. Bryce claimed that he had played no part in the incident, and the verdict went against Rusden, whose book was suppressed. Bryce was also awarded £5,000 in damages, a vast sum in those days. Because Bryce felt his name was cleared by the judgment, he accepted a lesser sum to cover his costs. But it is said that some Taranaki Maori still knew him as Bryce kohuru (Bryce the murderer). Bryce was chairman of the Native Affairs Committee from 1876 to 1879, and Minister of Native Affairs from 1879 to 1884. Responding to the growing pacifist settlement at Parihaka in Taranaki, led by Te Whiti-o-Rongomai and Tohu, Bryce passed legislation enabling the police to hold Maori without trial. In November 1881 he led 1,600 volunteers and Armed Constabulary to Parihaka and supervised the destruction of the settlement and the dispersal of its inhabitants. The Parihaka leaders Te Whiti and Tohu were imprisoned without trial for 16 months. Bryce remained Native Minister until 1884. He later defended his actions at Parihaka, attributing the blame to Maori cultural or moral defects. One historian has noted that Bryce's views were 'hopelessly at variance with Maori aspirations'. But although he was keen to speed the purchase of Maori land and the spread of European settlement, and severely reduced spending on Native Affairs, he also tried to cut back on wastefulness and fraud in the acquisition of land. His Native Land Sales Bill of 1880 embodied the idea that the Crown, acting as a trustee, should auction land publicly on behalf of its Maori owners. Many of Bryce's parliamentary colleagues did not support this, fearing that it would slow land sales. His Native Land Laws Act 1883 was designed to remove another source of fraud and sharp practice - it banned people from making any land dealings before the Native Land Court had determined title. We have 29 biographies, 5 articles, related to John Bryce.